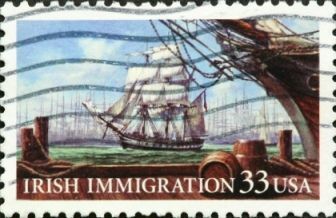 Irish American history: immigration from the 17th century to 1845. Irish American history began in the late-16th century with the transportation of petty criminals and beggars to the West Indies. These transportees were subsequently joined by prisoners of war, deported in the middle of the 17th century following Oliver Cromwell's bloody conquest of Ireland, and forced to provide cheap (slave) labour to the Caribbean tobacco plantations. The first significant wave of immigration from Ireland came in the 1720s. This period saw the arrival of the Scots-Irish, a term used in North America (but not elsewhere) to denote those who came from Ireland but had Scottish Presbyterian roots. Philadephia was the most popular destination port for Scots-Irish immigrants to America, mainly because the linen trade routes were already well established. They then moved into the Appalachian regions, the Ohio Valley, New England, The Carolinas and Georgia. 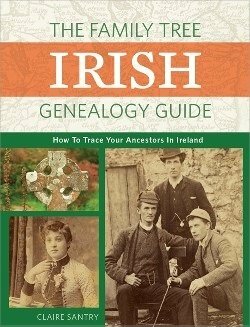 Written by the creator of Irish Genealogy Toolkit and Irish Genealogy News, this 240-page paperback, published May 2017, is full of essential advice and strategies for tracing your immigrant ancestors back to Ireland from America. After Independence, the history of the Irish in the USA stepped up a pace with an estimated one million Irish immmigrants arriving between 1783 and 1844. The majority, at least until the 1820s, were artisans or professionals so they quickly assimilated and prospered. The letters they sent home told of comforts the average Irish family could only dream of. Soon, many more were saving for their fare. This wave of immigration from Ireland saw the unskilled and illiterate arrive, ready to seek their fortunes, and many found employment as labourers on some of America's huge early infrastructure projects such as the Erie Canal. 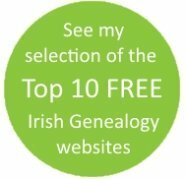 Learn about Irish American history from 1845 onwards. More than 36 million Americans identify themselves 'Irish Americans'. That's nearly 12% of the total population of the United States.